What I don't know about trees is a lot. 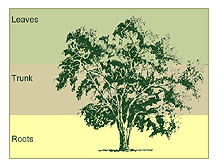 I know that acorns become mighty oaks, but I couldn't identify an oak if you asked me to. I know that there is a tree called the Larch (thanks to Monty Python) but I couldn't identify one if you asked me to. I know that some trees drop these flat brown seed pods the length of my forearm. We always see tons of them on our walk to school in the fall. My son B - you'll see more of him later - wanted to bring one in for show and tell once and asked me what it was. I had to look it up on the internet. 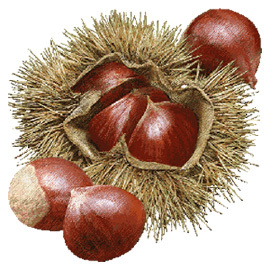 We also find lots of chestnuts on the walk home, which the boys insist on collecting and then forgetting about and which also come from trees. Trees make the oddest things. I used to know how photosynthesis works. I remember studying that in high school biology class. I don't remember the particulars now, but I know that what plants do is pretty amazing. I know that certain trees lose their leaves in the fall. I've even been to New Hampshire for fall foliage season. In the fall, the chlorophyll that makes the leaves green goes away and allows other colors to reveal themselves. In New Hampshire. I also know the words deciduous and conifer. I learned the former in school sometime and remembered it because it is such a cool word. I learned the latter from They Might Be Giants. I remember seeing the Cherry Blossom trees in DC when I was growing up. 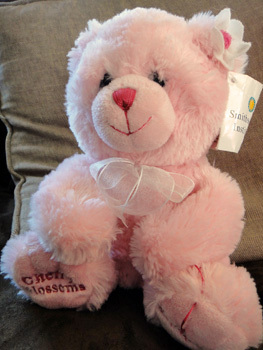 My daughter, L - you'll see more of her, too - has a teddy bear named Cherry Blossom from the Smithsonian. I remember reading The Giving Tree. And I know an ant can't move a rubber tree plant. Credit Laverne and Shirley for that factual nugget. So clearly you aren't going to learn anything from me. Try these instead. An awesome interactive program from Boston's Arnold Arboretum that will teach you a thing or two. One thing I learned: tree people are cool. 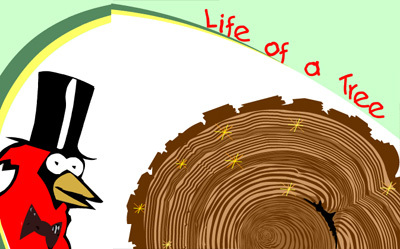 A fun exploration of what the rings in a tree trunk can tell us on the Arbor Day Foundation's kids site. How much will you change in the next four months? How much will your kids change? 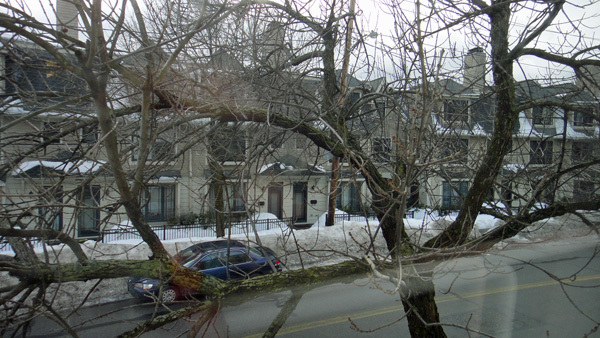 How much will a tree change? Over the next four months, I'll be watching this one tree, taking pictures of it, describing what it's doing (or not doing), asking questions about what's happening, and just jotting down whatever I see and think about my tree. I'm not going to do research about what kind of tree it is. I'm not going to do research about what exactly should happen to trees in springtime. I'm simply going to watch this tree and let her tell me. (Oh, yes, I've decided she's a girl. More on that later.) She is going to be my teacher for the next four months. Because she is the subject of a journal I have to keep for my science class this semester. And of course, when I hear "journal," I think "blog," so here we are. This page is an archive of recent entries in the welcome category. twigs is the previous category.